It's important to find a qualified Queens plumber for gas leak repairs. Gas leaks are not something that can wait. You will need to find a licensed plumber who's license states that they are a gas plumber. Only a trained and qualified plumber should work on gas lines. It is not only for your safety but also the safety of the community you live in. 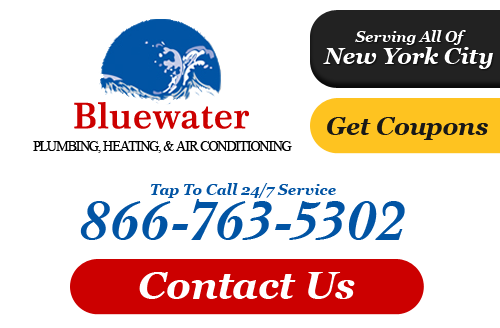 Bluewater, Plumbing, Heating, & Air Conditioning is available for emergency gas leak repairs in Queens and surrounding areas. Please call us anytime, day or night, weekend or holiday. Our professionals are licensed to test for gas leaks, find the problem, and repair it. Any time gas lines are installed or repaired in your home, the gas company needs to shut off the supply completely. There are specific requirements from Consolidated Edison and National Grid about gas repairs and new installations. Before service can start or be restored, the gas system should be inspected by the gas company. The local municipalities will also require permitting and inspection. Only a plumber authorized to work on gas systems is allowed to test, repair, or install gas systems. The license indicates they are a gas plumber. If these requirements aren't followed, gas will not be supplied to the home. A gas line may need repair or to be replaced, but how do you tell if you need emergency gas line repair service? Whether you are sure or not, follow these steps. First, everyone should exit the home. Make calls from somewhere else. Call the gas utility company so they can shut off the gas to the home. Next, call us ASAP for 24/7 emergency gas leak repairs. 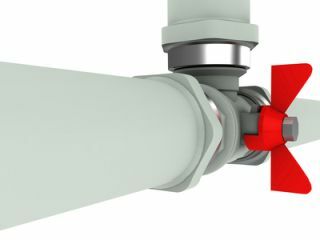 Air or water in the home is cooler - If your hot water or furnace isn't heating as well as it normally does, call Bluewater, Plumbing, Heating, & Air Conditioning for gas line repairs in Queens or our other service areas. This is a sign that there is a blockage which isn't letting enough gas through the lines to produce the normal amount of heat. Thinning gas lines - As a gas line ages, it will thin out in certain areas. Frequently, thinning occurs near the joints before the other sections. The seals, or gaskets, also often thin out where gas lines are connected to appliances. Obvious damage - You may see dents, bends, warping, rust, or other irregularities. The gas lines will need repair or replacement so future leaks don't occur. Dead plants in the home - If you have indoor plants that die, it could be due to a gas leak nearby. Sometimes there are medium to large dead patches in the landscaping which die off for no obvious reason. Noises - A hissing or whispering noise IS something to worry about. Smells - Natural gas has no odor, but there is an additive infused to make it smell a bit like rotten eggs. If you get a whiff of something foul smelling, better to be safe than sorry and act as if you do. If you are looking for a licensed Queens plumber for Emergency Gas Leak Repairs, please call Bluewater, Plumbing, Heating, & Air Conditioning at 866-763-5302 or complete our online request form.